Join us for another fun-filled night of support for our fabulous PTA at Blaze Pizza Newtown (5134 Main Street) on Tuesday, April 23rd from 5:30-8:30 p.m.! Bring the flyer below or show it on your phone in order for our PTA to receive 20% of the proceeds back for our school. We hope to see you all there! https://wjccschools.org/mw/wp-content/uploads/sites/18/2014/05/logo.png 0 0 Stephanie Carroll https://wjccschools.org/mw/wp-content/uploads/sites/18/2014/05/logo.png Stephanie Carroll2019-04-17 14:47:502019-04-17 14:47:50Blaze Fundraiser: April 23rd (5:30-8:30pm)! 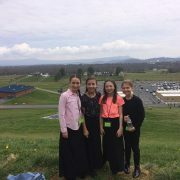 This past Saturday, April 6th in Harrisonburg VA, Makenzie Pesante, Gracie Aleska, Aubrey Pecota, and Taylor Anne Mason (all fifth graders) participated in the 14th Annual All-Virginia Elementary Chorus. Thanks to a grant from our FABULOUS PTA, all four students had their music, lunch, t-shirts, and registration paid for them. We had 12 students audition, and the four that were selected represented MW and WJCC very well! We are so grateful for these amazing opportunities for our students, Jordan Stehle (our awesome music teacher), and for our PTA! Congratulations to these extremely talented students . Fourth grade went on their annual trip to Grand Caverns and Monticello this past week! It was a beautiful day filled with rich history about the Civil War and Thomas Jefferson’s birthplace. 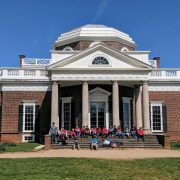 This is one of the most anticipated field trips in fourth grade, and it definitely didn’t disappoint this year . We are so fortunate to have these wonderful and enriching opportunities for our students! 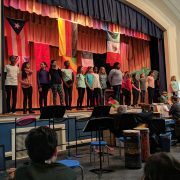 Our wonderfully talented fifth graders presented their annual “World of Music” celebration immediately following International Night to celebrate the heritage of some of our students families! There were performances honoring the Republic of the Congo, France, Germany, Morocco, Mexico, Jamaica, and Ireland. It was a fun-filled night full of diversity, love, and rich culture! 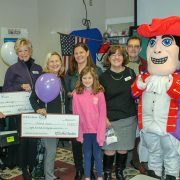 We had a lovely visit from the WJCC Grant Foundation (and Mattey of course) to present Mrs. Westmoreland, Mr. Van Deusen, and Mrs. Linkenauger with checks for grants received to benefit their students! This is just one of the many opportunities our school division provides to our staff and we are so grateful for it! 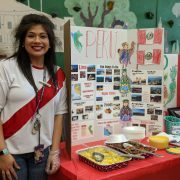 We had another successful International Night at Matthew Whaley! We had 15 countries represented, delicious food, wonderful performances, activities, and great memories made amongst family and friends. We love our Matthew Whaley traditions and celebrating each other’s heritages! 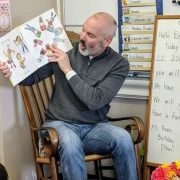 On March 22, Matthew Whaley celebrated our Read Across America Day with several guest readers! It was a great day to embrace our love of reading and being read to! Our state testing is quickly approaching! Everything you need to know about our upcoming SOL testing in May is attached here to include the following: which students are taking the tests, when the tests are taking place, what is being tested, and tips to help your student succeed.